Food plays such a big role in overcoming bulimia that I think it’s important to give you some of the reasons I became a vegan, and share with you how it can help with bulimia. Changing our eating habits is a major part of bulimia treatment, and veganism offers another option for you while you are rethinking your relationship with food. Being a vegan means removing the use of animal products from your life. Vegans comprise a diverse group of people, who have changed the way they live for many reasons, and I’d like to share with you three of mine. As I took a look at my overall health and wellbeing, I found that veganism offered not only food that was a healthy diet, but food that can actually help me to avoid the most common medical problems today. For instance, a vegan diet can help to prevent the development of cancer. One of the reasons for this is that vegans eat more foods loaded with things like anti-oxidants and other cancer fighting ingredients. For example broccoli and other cruciferous vegetables have cancer fighting properties. Another great reason for going vegan is how avoiding animal products helps protect your heart. With heart disease topping the charts as a major health problem in the US, it’s pretty clear that the way most American’s eat has a lot to do with the top medical killers amongst Americans. Plants are cholesterol free, whereas meat, eggs and dairy all contain saturated fats. Those fats are what build up in your arteries, and clog things up, leading to heart disease. A vegan diet can not only help to prevent this if you are already healthy, but the change can make huge improvements if you’re having problems with high cholesterol and blood pressure. Veganism can help with bulimia, because when you are living a vegan lifestyle, your fridge will be packed with fruits and vegetables, serving to reduce the risks of emotional eating. It’s easy to see that Mother Nature is under attack because of the Western lifestyle. People are making choices to help improve the environment through reducing waste, recycling materials and reusing what they already own instead of buying new. I was a big proponent of saving the environment starting in 2007 when I first learned about what we’re doing to the planet. In fact, I was handing out leaflets about saving the planet at Al Gore’s live presentation of his slide show called “An Inconvenient Truth”. At that presentation someone walked up to me and handed me a flyer with the headline “how can you be a meat eating environmentalist?” Until that moment I had no idea the #1 way we as individuals can make to reduce our carbon footprint is by not eating factory farmed animal products. Factory farming, especially in the United States is a huge contributor to the release of green house gases (methane). Aside from polluting the air, they are responsible for contaminating the ground water for hundreds of miles around their farms. Additionally, it takes up to 10 lbs of feed to make 1 lb of beef so we’re actually cutting down rainforests to raise food to feed our factory-farmed animals. Veganism is also an ethical choice for me. In fact, it’s the number one reason I chose to be a vegan. As a lover of all animals, justifying the consumption and use of animal products wasn’t something I could consciously do. I believe all life is precious and no other living creature is being killed for my lifestyle . If you study the way animals are treated during their short lives in factory farms, whether they be chickens, cows or pigs, it would shock you. Most people turn the other cheek because they want to continue to consume unconsciously. They let their stomach dictate their values. I choose differently. I choose to be conscious of the impact of my decisions – in what I eat, what I wear, and what I buy. I’ve found that being a vegan offered help with my bulimia. By knowing that I’ve made healthy choices in the foods I consume I have no guilt and live consciously knowing my food didn’t suffer for my survival. 1. Leonardo DiCaprio—Long-time environmental and animal activist Leonardo DiCaprio has been known to enjoy a meat-free diet for several years. It’s unclear whether he’s a vegan or a vegetarian, but it’s clear that he stays away from meat. 3. Jenny McCarthy—The beautiful actress and comedian shared during a visit to The Rachael Ray Show that she is a vegan. 4. Zooey Deschanel—The adorable star of 500 Days of Summer revealed she was a vegetarian when she was a guest judge on Top ChefMasters. She also added “no eggs or dairy” to her instructions, which lead many of us to believe she’s vegan. However, she identified herself as vegetarian, so that’s all we have to go on. 5. Emily Deschanel—Healthy eating seems to run in the Deschanel household as Zooey’s sister Emily, star of Fox’s Bones, is a prominent Hollywood vegan. She’s even turned her costar David Borneaz into a part-time vegetarian. 6. Sandra Oh—The Grey’s Anatomy star has been on a crusade to expose her castmates to the her meat-free lifestyle. 8. Alicia Silverstone—Alicia Silverstone released her own vegan cookbook called The Kind Diet. She told Oprah that her switch to a vegan lifestyle helps her sleep better, have more energy, and just look more beautiful. 9. Alanis Morissette—Early last year, Alanis Morissette shared that switching to a vegan diet helped her lose 20 pounds. She said she felt like a 12-year-old again with a lot of energy. 10. Joaquin Phoenix—The vegan star of Walk the Line can be found in various PETA ads campaigning against animal abuse and consumption of animal products. 11. Carrie Underwood—In 2005 and 2007, Carrie Underwood was named by PETA as the “Sexiest Vegetarian Alive.” The country singer and American Idol winner first shared her lifestyle choice by wearing a “V is for Vegetarian” shirt during a TV performance. 12. Brad Pitt—Pitt has been identified as a vegetarian by numerous sources throughout the years. His love interest, Angelina Jolie, was even a vegan until she said that her diet nearly killed her. There are even rumors that Jolie’s meat eating habits have started to upset Brad. 13. Tobey Maguire—Not only is the Spiderman star a diehard vegan, but he’s also partially responsible for helping Natalie Portman take up a diet completely free of animal products. Talk about a vegan crusader! If you’re a vegetarian, vegan or considering becoming one, please share your comments below on why you chose this for your life. Was it for ethical, health related, or environmental reasons? I’d love to hear from you and thank you for your feedback! hi there. Ive been bulimic for about 11 years now ( Im 26) and have really been struggling to get better so I have been looking into the vegan lifestyle. I am a huge enviromentalist and animal lover as well so it seemed like a really good idea. Im researching now and planning on taking the plunge within the next few weeks but am VERY nervous about my eating disorder. I dont want to mess this up. Any advice would be helpful 🙂 Thanks for your post.. If you could clarify, I’m happy to share what my experience has been with either or both. I love saving the lives of animals every year and I love even more not obsessing about food and allowing it to run my life. If I can share what I know and help you, I’d be happy to. After more than 35 years of being a bulimic, I finally faced up to the fact that I had a serious health problem! It happened after I turned 57 and watched the documentary “Forks Over Knives”. I wasn’t thinking of bulimia when I decided to go vegan. I was only thinking about the family history of high cholesterol and diabetes. So, in January of 2013, I decided to give it a try and see if my slightly elevated cholesterol would respond. Well, it did. After several months of healthy, plant-based eating, I realized that my periodic bulimic episodes and constant obsession with food had STOPPED! If you have bulimia, PLEASE try it. Wow, Cheryl! Thank you for sharing your amazing story. That’s fantastic to hear that this created a shift for you and allowed you to transform, not only your body, but also your mind so that you could release your eating disorder. I honor you and celebrate you! I’ve been bulimic for almost 2 years now and I’ve searched for the light for some time. I think I have found the free life when I became vegan. I don’t know if it’s the “redtricting”, you know I can’t eat meat, ordinary yogurt or ice cream. My binge food was almost the same every time, bread with a lot of butter, cheese, quark, pizza and so on. But now, I feel disgusted. I don’t wanna eat anything that comes from animals, ever. I feel so clean, I have a lot of energy – I do feel free. Still, I do have some anxiety for all the carbs I eat, but I would never replace my fresh veggies with the 1% quark that was my safe food before veganism. Good for you to follow your values and align what you put into your body with those values. If I can do anything to help you release the habit patterns of bulimia, please reach out to me, ok? Being a vegan feels good to me, so that’s why I do it. It aligns with my values for treating animals, the planet and my body in the best way I can. Nice how it all fits together. I commend you for being in integrity with your food and what your body needs. Our health is soooo important to our overall well being. When your body is filled with junk and run down (too many to do’s, not enough rest, no exercise) we really pay the toll within our mind, not just the body. I’m finding that as I’ve been vegan for a few years now that I may need to introduce some healthy dairy here and there. My body isn’t taking in as much in terms of probiotics to fend off the bad germs. I am on a new probiotic to help give my intestinal system a good boost each day. It’s really making a big difference and I feel better! Whoa! I was looking up “going vegan as a bulimic” and arrived on this page. I know your blog and like your approach to recovery so this is definitely an incentive for me to look further into veganism. How did you educate yourself on having a healthy non-animal diet (getting in all the necessary nutrients etc.)? Gosh Regina…how much time do you have? I’d say it’s a never-ending journey, right? New information is available to us constantly. I would not say I’m ever fully educated on health and nutrition like I could be. I’d say listening to your body is the most important thing. I’ve met vegans turned back to animal eaters because their bodies simply didn’t accept the change well. It may not be for everyone, just as eating meat isn’t for everyone. I have a wonderful holistic wellness center where I live so I do muscle testing, blood work and a woman who is a local nutritionist/chef gives me all kinds of free advice. Just allow the information you most need to be found/allowed into your life and be curious. Ask questions, dig, probe…dig further. Listen and learn as you go. Is there something in particular you’re concerned about with going vegan? And to add to this I am at this time in my journey eating a little cheese from time to time. I don’t buy it intentionally, but on occasion I will accept it in a salad or such. I still love animals and do my very best to make animal-friendly choices, but I also learned over the years that if I’m being a perfectionist or strict about something I’m holding myself back. I’m not allowing all the best to come to me. Thus, I choose what works for me in each and every situation and makes me feel good. All in all life for me comes down to doing what feels best to me at that moment. If I listen to my inner wise woman I’m good. Hope this helps and please let me know if I can answer any specifics, ok? As I read this post and your comments, I am literally tearing up.. i have SO much admiration, love and respect you! I was living my recovery from 2011 to early 2014 and was doing OK until I decided to go vegan, then all of the sudden my ED tendancies came back. It was tragic! I relapsed after I went oil/salt free and felt so guilty for wanting dairy products. I should have known better than to go on any extreme way of eating. I’m just not able to do that, and it’s unfortunate but my truth. It was really a sad but necessary experience for me. Now I’ve come a long way again back to recovery, and today I am eating what I feel my body needs. Sometimes it’s dairy, sometimes it’s meat, most of the time it’s plants, but regardless, I just have to be at peace with my body. I am a lover of animals and the idea of eating in a loving way really appeals to me, but my body just doesn’t seem to support a vegan diet. At least not yet, I was bulimic for over 20 years so I think it’s just going to take time to allow my body to heal and know that I’m not going to restrict or abuse it anymore. I deserve to do what’s best for my body first before anything or anyone else…. Much love and gratitude to you Polly! I commend you for trusting your inner guidance my friend. That is truly where the path to what makes us happy and fulfilled ever comes from. It doesn’t come from what one author, one association, one religion can teach us. We must take in what the world has, check in with ourselves and go with what we need in the moment. Truly. The path of happiness and self-fulfillment isn’t a one-size fits all, do this and then you’ll be happy forever recipe. It’s why we’re here. Sorting through what works and doesn’t work for us and getting more clear with each step. I am pretty much vegan and occasionally eat animal products (never meat, but once in a while eggs and cheese if I feel I need to). It’s working for me, but I let the dance of what’s best be a conversation I have with myself in each moment and choose. And forget that regret crap. Whew! The faster you get to self-love and let go of regret, the better you feel. As you can probably tell I’m a big fan of feeling good as much of the time as possible. I wish you well on your journey sweet friend and please stop by to say hello anytime. I was bulimic and I became vegan and gained 15lbs. So now I’m bulimic again, but a bulimic vegan this time. Sounds like you’re finding your way to what works/doesn’t work a little at a time. There’s no saying that vegans will be of a healthy weight because you can eat fried foods and sugars all day long and it won’t serve your health. Hopefully you’ll find the balance and understanding that comes from a healthy relationship with your body AND food. Your body knows what it needs so you might consider how to tune into it better. Please let me know if I can help! Email me, ok? Yep. My life. I hate food. I hate everything. We can choose to be happy or we can choose not to be. I am reminded of the story of Nelson Mandella who hugged the security guards who were guarding him when he got out of prison after 20 years. That man truly understood the power of our inner dialogue, our mind. When we look at life and expect it to be some way and tell ourselves a story that puts us into suffering, we feel badly. I am wondering from your words what’s going on in your world for you to hate everything. I can’t see the world through your eyes, but I can sure listen to what’s true for you. And if you want help to feel better, then I’d do my very best to help you get where you want to go. I don’t believe as humans we are here to feel bad. Anger is better than depression or feeling helpless that’s for sure. Just don’t unpack in anger/hate and live there. Try to find better feeling thoughts each day that help you move up the emotional scale towards peace and then hope and then happiness. It’s not a jump we want to take from anger to joy. I tell you it’s not possible. But it is our job if we CHOOSE to to help ourselves feel better. But, ya gotta want it. My prayer for you today is that you find your way out of anger and take one step towards feeling a little more of the love that lives inside of you. For yourself or someone else today. I know it’s there and I invite you to feel for it. Find something you can appreciate today and bless it. One small step. Give it a try, ok? Just “found” you while looking up “former bulimic, now vegan”. I’ve battled bulimia for at least 30 years, and time and again tried to clean up my diet, but addiction to food, sugar and the coping mechanism that is my ED sabotaged me every time! I went low-carb a couple of years ago, and while I struggled with that, as well, (binged/purged all the way through it, in fact), I got my weight down to near underweight.. the lowest it had been in a long time. Unfortunately, that lasted all of a day. 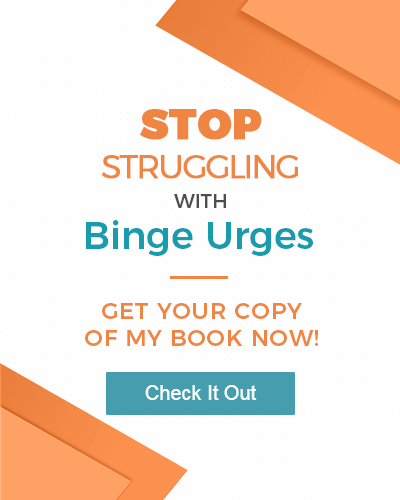 The bulimia was just too strong and I binged my way back up. It’s been a struggle since then as I’ve tried to find a way to eat healthy without my ED rearing its ugly head. It has always been a VERY risky thing for me to try and change my diet in any way due to my very long ED history. I think that’s the issue one of your commenters was trying to express: how to comfortably make healthier changes to your diet without the ED sabotaging you. Anyway, fast forward to about a couple of weeks ago.. I had been reading a lot about how to eat healthier because I am so afraid of becoming a statistic. I didn’t want to be one of those people who “automatically” had to start taking pills for physical ailments.. so I vowed that I had to do SOMETHING. Unfortunately, I still had plenty of bad days with the bulimia and emotional eating, and it didn’t help that everywhere I turned, I read conflicting information regarding what to eat. (Paleo vs. Vegan /vegetarian, for example). All this to say, things finally clicked about a week ago…and it all came down to a matter of perspective. You see, I’m a lifelong sufferer of social anxiety and depression.. and in reading about “how/what” to eat, I was reminded of how food affects mood… so I decided to cut out all processed food, save for anything with natural ingredients I can pronounce in an attempt to heal my brain. It’s been quite a blessing because it took! That one change in perspective did it! But wait.. It gets better. You see, I’m very spiritual, and lately I’ve been experiencing a lot of synchronicity with numbers and tingling at my crown chakra.. I seem to be becoming more aware that I’m spirit, that this reality is fake, and that we are all one.. and suddenly it just didn’t seem right for me to continue to eat animals. I’ve BEEN trying to “go” vegan on and off at various times in my life, but again, the ED would sabotage me. But this time I think I can eventually do it because the motivation and perspective feels different. I’m still eating chicken (and use eggs in cooking if I have no choice), but I only eat poultry twice a week, no dairy or grains, and eventually hope to eliminate chicken, altogether. We’ll see, because I know some bodies respond better to more animal products so I can’t say never, but I’m happy to say that as of now, my diet is more like 90% vegan and I feel GREAT! My cravings have virtually vanished, and except for one set-back and one close call, I haven’t had any bulimic episodes. I recommend that anyone suffering from binge eating or bulimia adopt (at the very least), a whole foods diet, and STAY AWAY from processed foods. All that crap does is “feed” your ED. It perpetuates your disorder because the food is designed to be HIGHLY addictive. Eat REAL food. I believe I’ve been succeeding this time because I’m focusing on how I FEEL, not how I LOOK. That can make all the difference. Sorry this is such a long comment, Polly. Feel free to contact me personally or edit what I wrote.. and THANK YOU for not proselytizing or getting “Holier Than Thou” about being vegan! There’s TOO MANY of those types running around and making people leery about even trying to become vegan because they don’t want to turn into those people. Congratulations on having the grace and respect to acknowledge that being vegan or even vegetarian isn’t a lifestyle for everyone. Every body is different, and one must do whatever is going to make them feel healthy and feel good. Firstly, I never try to edit someone’s comment unless it’s unreadable or abusive. Yours was one of the nicest things someone has said to me – especially on this topic. I’m glad you’re trying new things and finding what works best for you. That’s all I hope anyone will do if they’re not happy with their health – or their health isn’t happy with their eating. We are in charge of our choices and choosing consciously is key to feeling the best you can. I love that the reduced processed foods helped you so much with the cravings for binging. I haven’t thought about that impact so directly, but I’ll definitely keep it in mind during my coaching with clients. I appreciate you bringing that to my attention and you’re so right. Please keep focusing on how you FEEL and not how you LOOK. That’s one of the keys to a happier life, so you’re definitely on a great path my friend. Please let me know if I can help you in any way and come back and say hi in the future. All of you is welcome here.